Sliding windows offer many advantages for your home. Sliding windows are virttually synonymous with gliding windows; simply two different terms to define the same type of home window. Since they glide or slide smoothly along a track and don’t tilt open or closed like some do, they are a great option in areas where protruding windows would interfere with the exterior space. If your windows open out to a walkway, breezeway , patio or deck, they are the perfect choice. Sliding windows easily open and close by just sliding the sash along a track. Some window choices only slide open on one side with a fixed pane on the other, while others will slide from both ends. Some slide horizontally, while others slide vertically. There are lots of options available. Typically they offer a large expanse of glass in a relatively small frame. That means better views and less obstruction of those views. In fact, as fixed framed windows go, the sliding option offers one of the largest glass-to-frame ratios. Most sliding windows have very contoured and streamlined window frames. This allows the view through the glass to take center stage. Horizontal sliding windows make it easy to reach out to clean the exterior of the glass. Some gliding options offer tilt-in features, for ease of cleaning. Other models allow you to pop out the movable glass pane for cleaning, but this can be more cumbersome. Overall maintenance is relatively minimal, although wood frames will require more ongoing maintenance than a vinyl frame. The cost of sliding windows range from $125 to $700. Whether you pay at the low end or the high end of this range depends on the size of the window, the frame material, glass package, hardware options and the complexity of the installation. More on sliding windows costs. 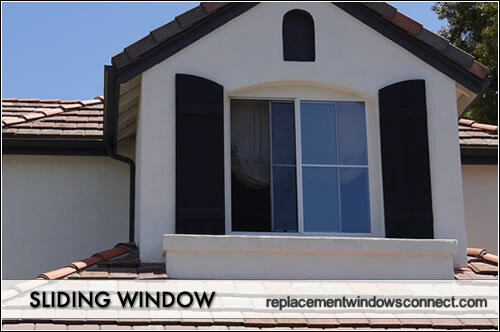 Since sliding windows include no hinges, cranks, or easily breakable parts (as is the case awning or hopper windows), they are less likely to require repair. It is rare that there is a problem with the track that cannot be solved by simply cleaning or lubricating the track. Sliding windows can reduce energy bills by as much as 25%. Compression seals limit air leakage. Most sliding windows come in double or triple paned options. There are various energy efficient features that can be selected to increase efficiency, including low-e coatings, glass fills, and more. There are numerous design and functional options to choose from. Some models include one stationary sash and one gliding sash, while others have two movable sashes so they can be opened from either end. Sliding windows can also be placed on either or both sides of picture windows to provide ventilation while keeping with the look of open, unobstructed views. Although most people think of sliding windows as horizontal sliders, double hung windows are also a type of gliding or sliding window. The main difference is that a double hung window slides vertically rather than horizontally.